While we were risking our lives to drive across the Twin Cities in heavy snow for the funeral on Sunday, our property back home was getting buried by another plowable layer. That meant, when I got home from work yesterday, I needed to plow and shovel a few hours worth of snow to get the place cleaned up. Normally, this is a very rewarding endeavor, but this time it felt a little insane. Expending all this energy to clear snow when even more is imminent. By the end of the day today, our landscape will likely look as if I hadn’t done anything, if the passing precipitation lives up to what was predicted. As fast as we clear away fallen snow this February, more falls to replace it. My heart wants to just wait until it stops snowing for a few days and then plow. My mind knows the folly of such a plan. The more often I plow, the easier each following effort will be. There are a couple of challenges created by these repeating waves of significant snowfalls. It is getting harder and harder to clear the snow because the piles are growing mighty tall, and the deep snow on our roof is leading to ice dams on the eaves. That second one is a compound problem, actually. 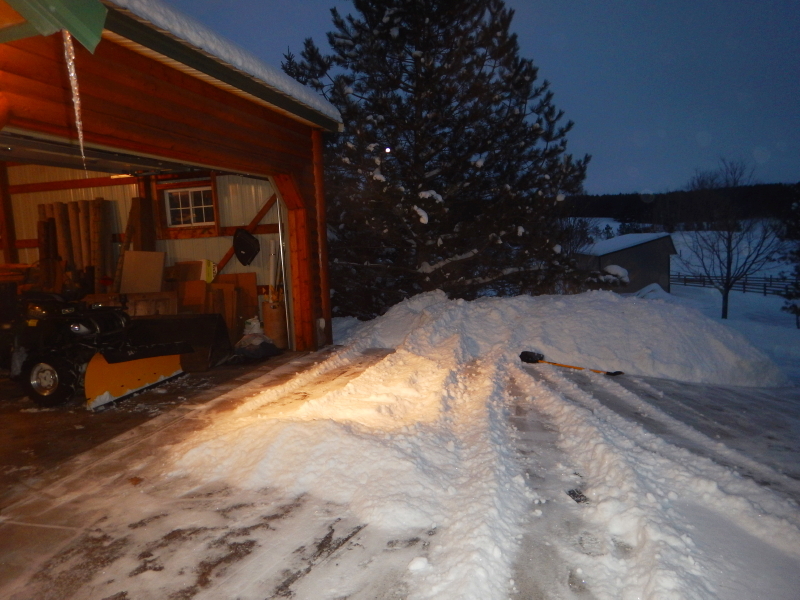 I can pull the snow down off of the roof with a rake, but then I need to shovel it somewhere. That means I have to throw it up and over the tall piles that already exist. Just what I need. More shoveling! I can’t keep up as it is. It’s almost like the early summer growing season, when the grass grows so fast that it needs cutting the day after I just finished cutting it. We are a land of two main seasons: shoveling snow or mowing grass.